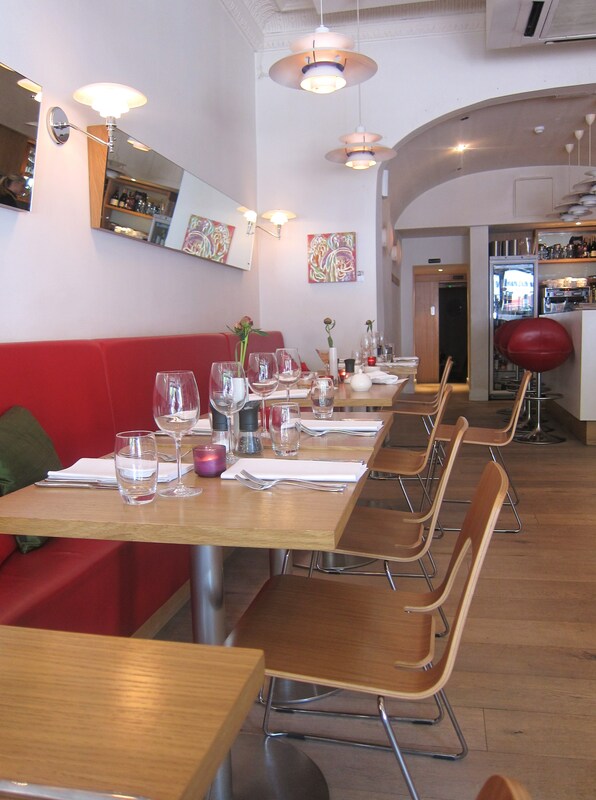 A small, cute, clean modern Scandinavian restaurant in South Kensington that I really wanted to love, but can’t quite find reason to. 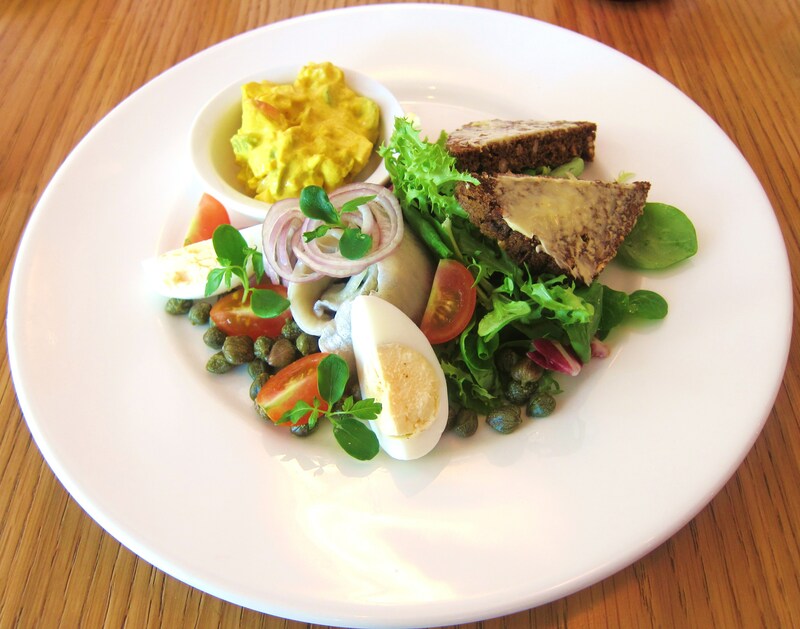 Well, the herring was pretty good and they serve a mean brunch platter. But a couple of lacklustre open sandwiches and four dry meatballs with no redeeming qualities don’t exactly have me chomping at the bit to return. 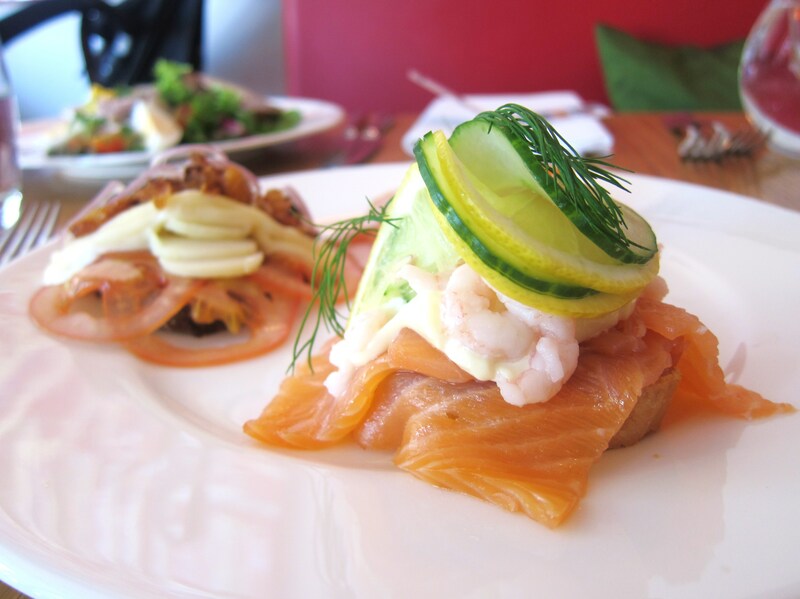 In any case, it’s a pleasant place to hang out and, if you order well, you might just end up with some decent Nordic grub. 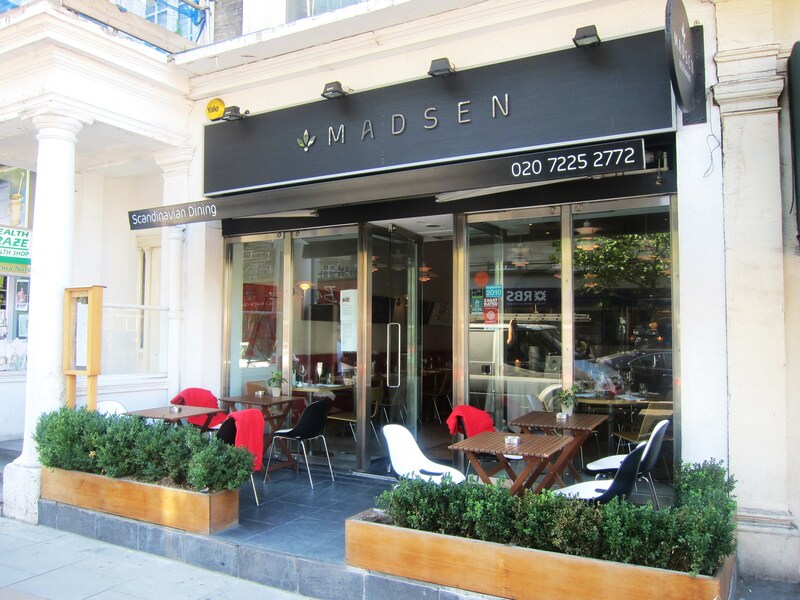 I had wanted to visit Madsen, a still *relatively* new Scandinavian restaurant in London, since it opened around the beginning of 2009. 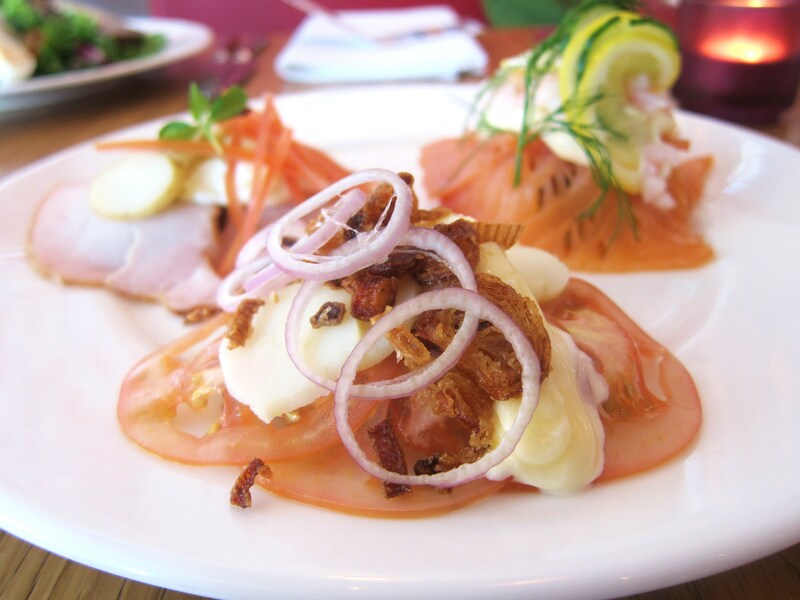 Being a long-time fan of food from the region, I was eager to get a taste of the food without having to travel there – although I do like visiting the Nordics, Sweden especially. Somehow I never made it during the opening hoopla, but I did follow them on twitter from very early on (so it felt like I had been there, at least) and mentally noted the mostly positive reviews from the blogger- and twitter-ati, as well as the traditional press. The entrance - notice the very Scandinavian use of blankets for outdoor seating. Why don’t they have this in England more commonly?! Anyhoot, it just so happened that we were out to get Baby LF’s French passport in South Kensington (where else would the French embassy in London be located?) before embarking on our transatlantic transplantation. 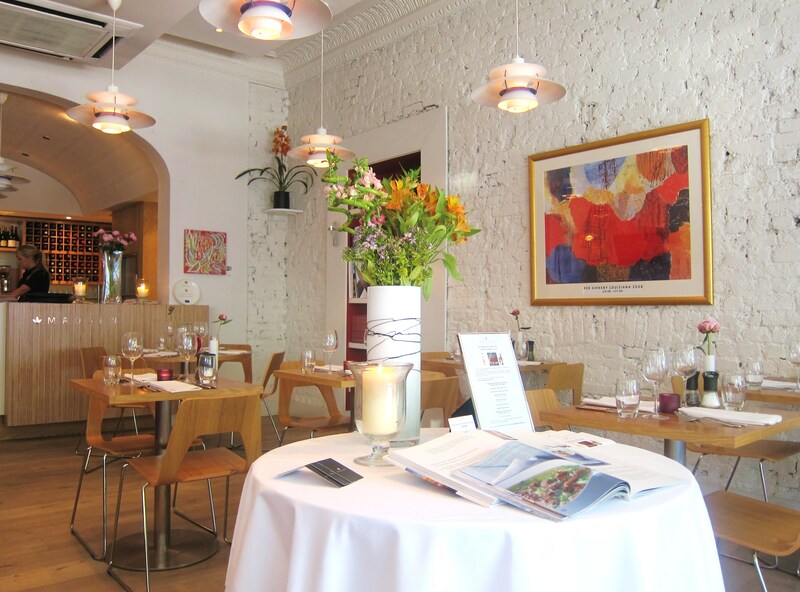 It was nearing the end of what is generally considered ‘lunchtime’ and I remembered that Madsen was in the area, so we walked around the corner and espied a nearly vacant dining room, with one couple eating on the small terrace and the inside totally empty. Perfect, we had plenty of room for our little princess, and could relax and stretch out. The lunch menu made good for reading, and pretty soon we had whittled down the choices and made our selections. The dining room is typically Nordic, employing clean lines, lots of white and wood, and dramatic utilization of splashes of primary colors. It is a simple dining room that is inviting in the daytime and (I imagine) sufficiently atmospheric in the evening. …and now peer down at your table, and please be seated. 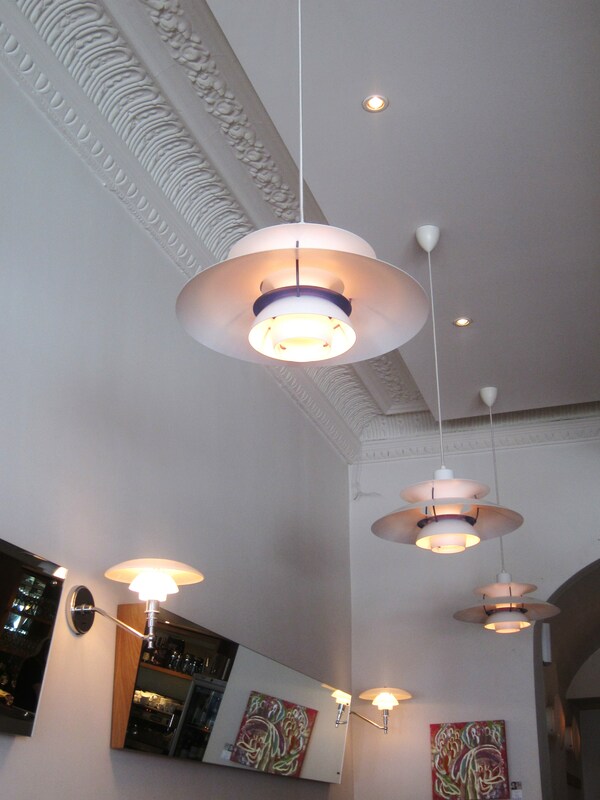 Given the restaurants roots, I have opted for Scandinavian minimalism in terms of commentary (sparser than usual, at least). The herring was excellent, as good as I’ve had in Sweden and Denmark, and I enjoyed this element the best out of all the components in the dish. The curried salad was also pleasant and not too cloyingly sweet. The rye bread was average at best and definitely not up to the standard that I’m used to in Nordic countries. 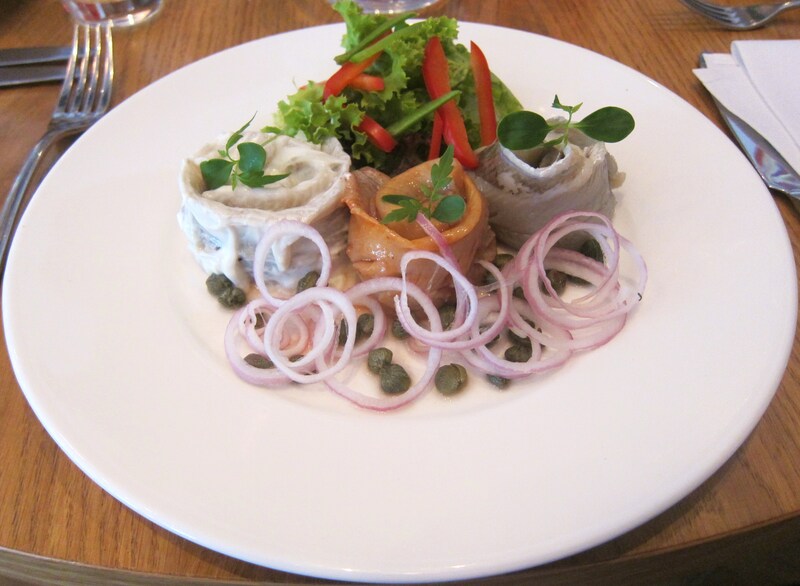 The salad was fresh enough, but it was all about the herring. 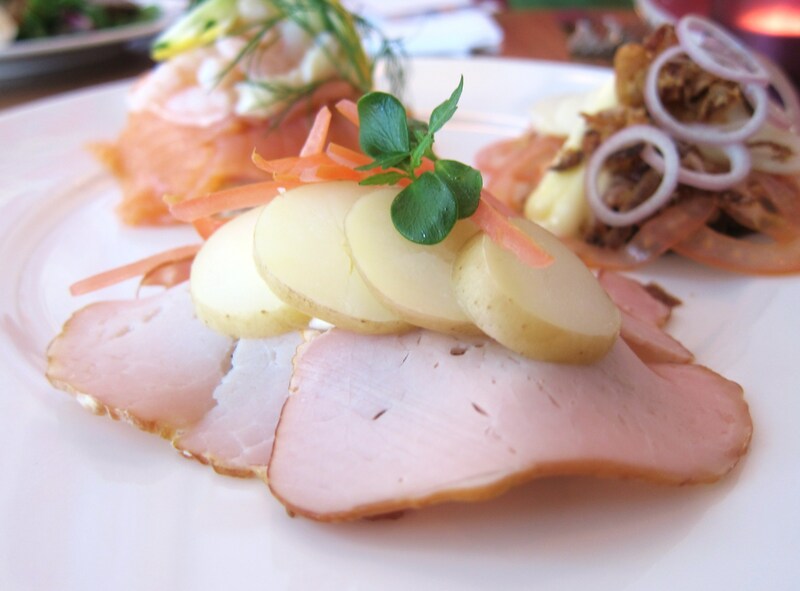 Mrs. LF opted to go for the Smushi Lunch Platter, a trendy type of small open face sandwich gracing Denmark’s eateries as of late. It was certainly prettily presented. This was Mrs. LF’s favorite of the three. It was good: not a knockout, but a satisfying classic nonetheless. That said, how hard is it to prepare a simple but tasty smoked salmon sandwich? The other two smushis (can you say that?) were “take it or leave it” for both of us and not particularly rousing – a let-down for sure as they did look very appetizing. The veggie sandwich was probably our second favorite, saved in part by the crispy onions (these are nearly always good additions to plainer sandwiches, and hot dogs too, in my book). When I saw the words “smoked pork loin” I somehow didn’t envisage some thinly sliced cold-cut-ish looking meat. Also, the menu description wasn’t particularly accurate in this instance as those were definitely potatoes, and not tomatoes, on top (I know they rhyme, but c’mon…). Anyhow, this was below average and we found it boring and uninspired. We also found the platter to be pretty expensive for what it was at £9.50. Unfortunately, things went downhill from there. 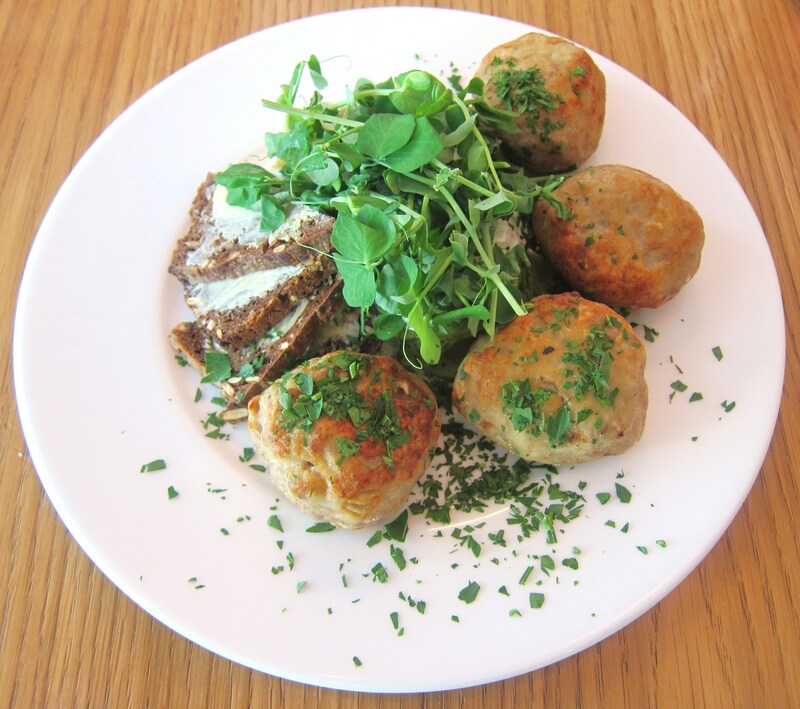 I don’t know how to say it other than these meatballs just didn’t taste good. Maybe I was disappointed because, again, they had been presented attractively, or maybe it was the fact that there was no gravy or sauce to accompany them and bring a much-needed counterpoint to the overly porky flavour and dry texture, but it just wasn’t happening. I really didn’t enjoy my main course and, having tried a bite, Mrs. LF concurred – and she is, like, well forthright, innit. Despite our hit-and-miss experience (with more misses than hits), we still had a fairly nice time at lunch – the waitress was sweet and we liked the look and feel of the little venue. We decided to give it a second try when we saw they had a brunch menu, as we were due to meet some friends who live in the area that coming weekend. 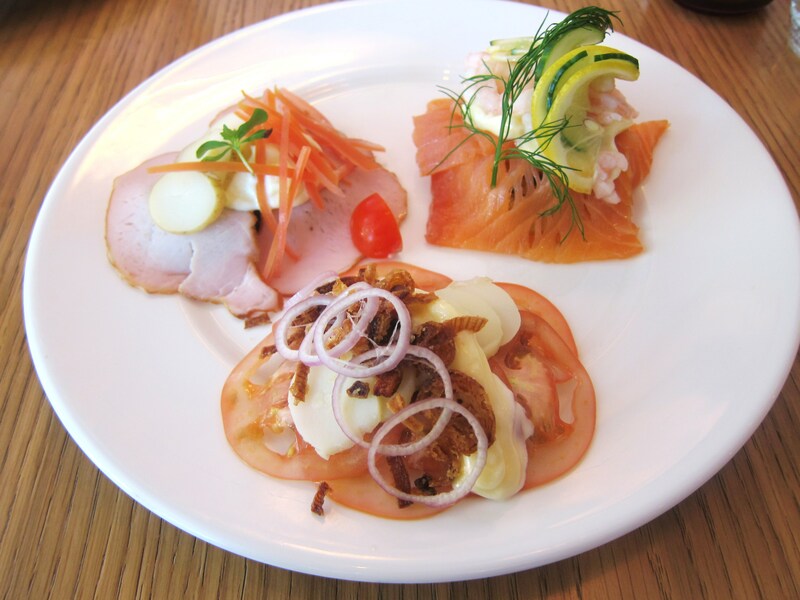 I decided that from the relatively concise brunch menu, I would opt for the Nordic Brunch Platter as I was particularly hungry. Rodier Pere et Fils Champagne N.V. 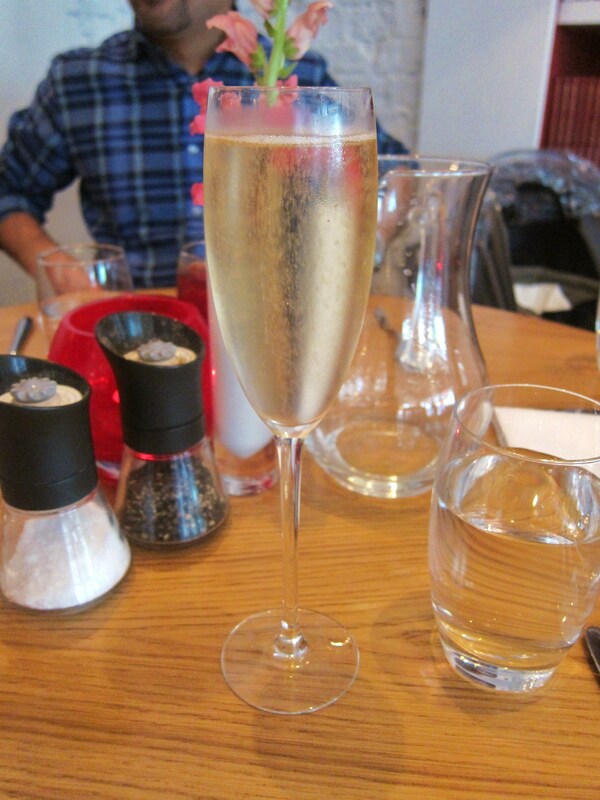 But of course upon noticing a decent N.V. (no, not a boring Dutch corporation) they had by the glass, I opted for a flute of champagne to start off the proceedings, and of course to serve as a good role model for Baby LF. 🙂 It was a satisfying beginning, though it’s not one of my favorite N.V.’s it has to be said. I had envisaged my massive horde of food to arrive as a one complete unit. But instead, it seemed to be dismembered and presented in parts. Fair enough, I suppose. The first component to arrive was the yogurt. It was natural and unsweetened, which I liked. 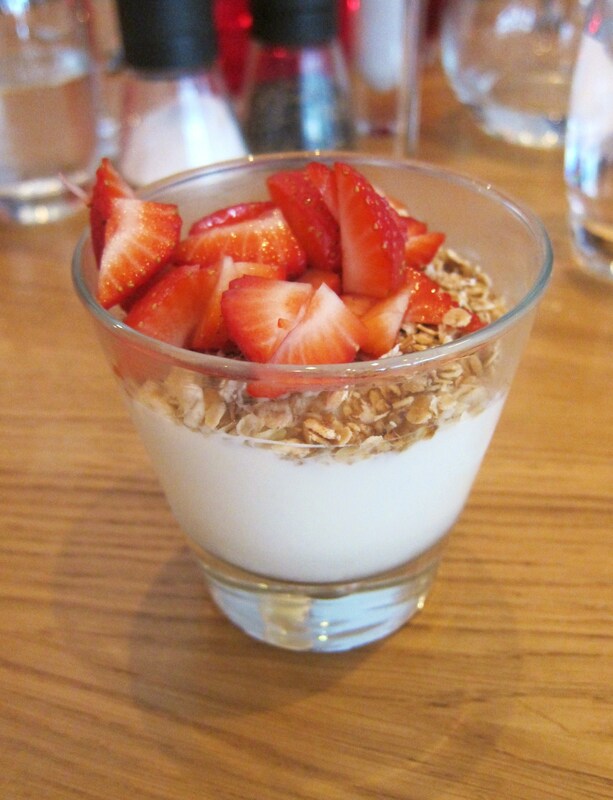 It made for a very simple but nice start to my ‘platter’. That said, I could have just as easily made this at home. Ah, now here was the promised mound o’ food I was after. It was a pretty huge platter, but it was all executed nicely. 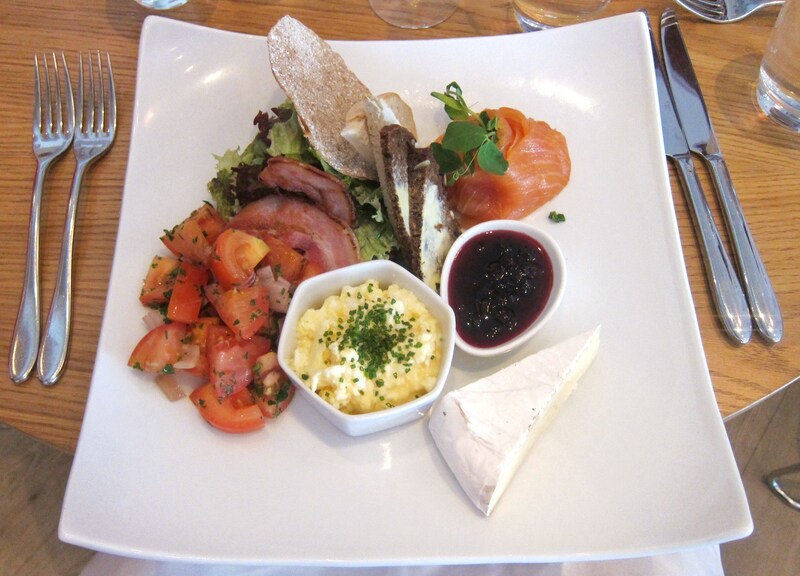 The eggs were well seasoned, creamy and fluffy; the salmon was fresh and excellent; and the brie cheese itself was of very high quality and lovely with the berry compote. 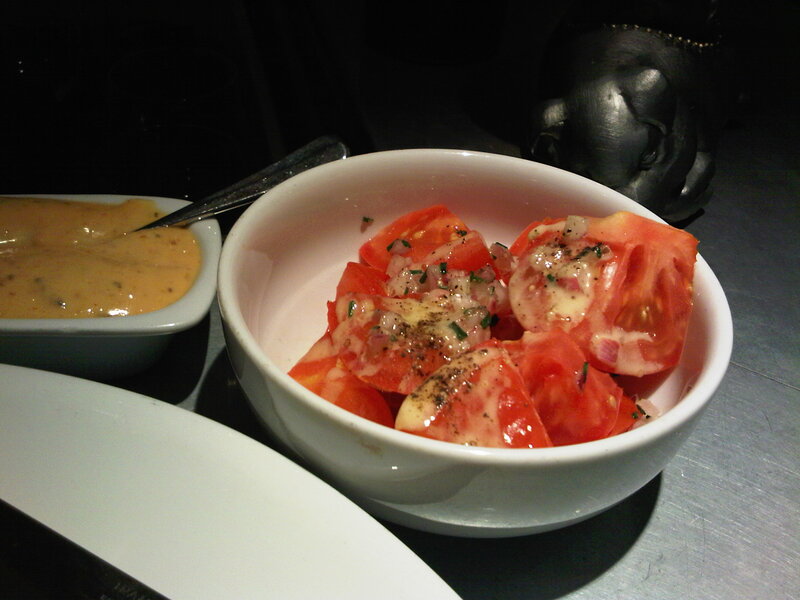 The bacon was nice and crispy, though a tad too salty for me, and the tomatoes were just about sweet. I enjoyed my Viking platter of brunchy bits. 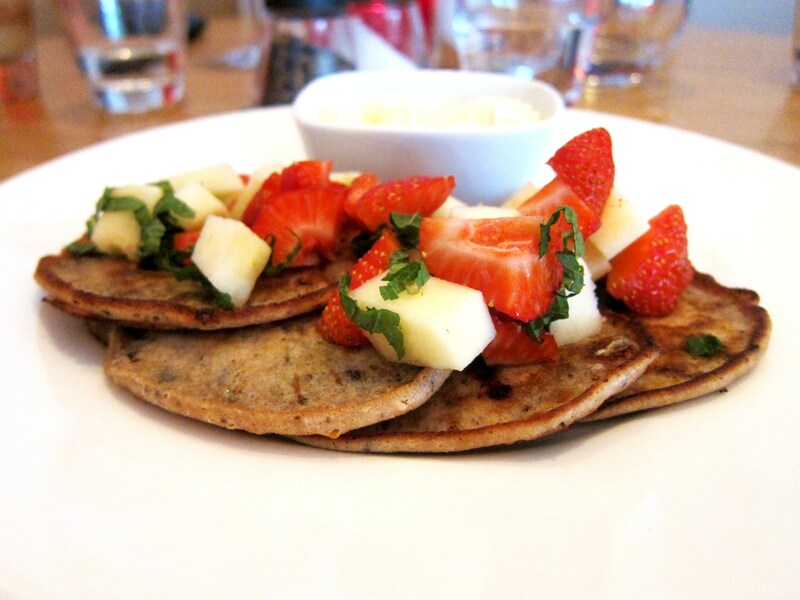 The chocolate chip pancakes, which served as a finale to my platter, were okay – they were cooked through properly and the chocolate chips were nice inside them. However, I felt the plate was too dry (and I don’t particularly like whipped cream with breakfast pancakes), and thought it would have benefitted from some kind of sauce to tie everything together. You know, like the Big Lebowski’s rug. One of our friends ordered the large herring platter, which consisted of three types of marinated herring (onion, juniper berry and Madeira) and served with a garnish and rye bread. I didn’t have it on this occasion, but as noted earlier, my (onion marinated) herring at Madsen from our previous lunch was excellent, and my friend thought the same. Said friend also ordered a smushi of roast beef. 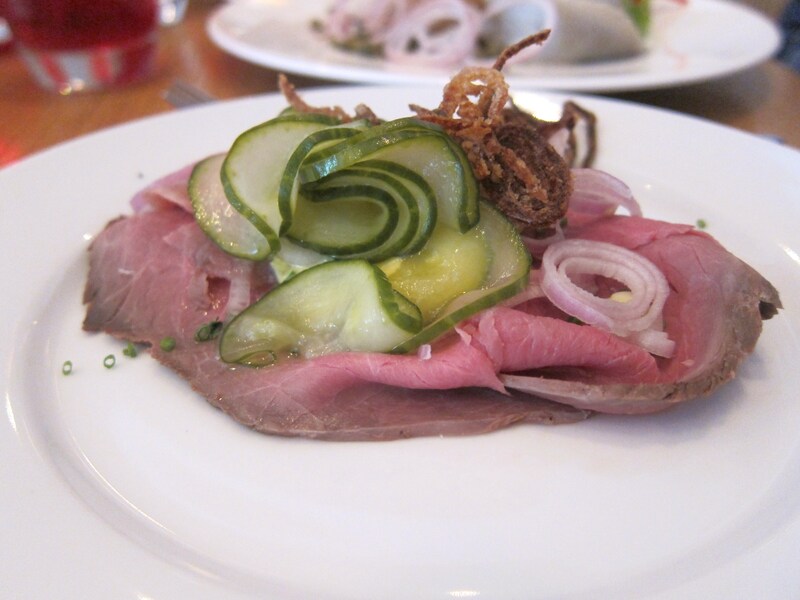 This was topped with crispy onions, pickled cucumber and fresh horseradish and was served on rye bread. I didn’t get to try it but it looked amazing, I have to say. Our other friend is vegetarian (I did mention she’s in fashion, right?) 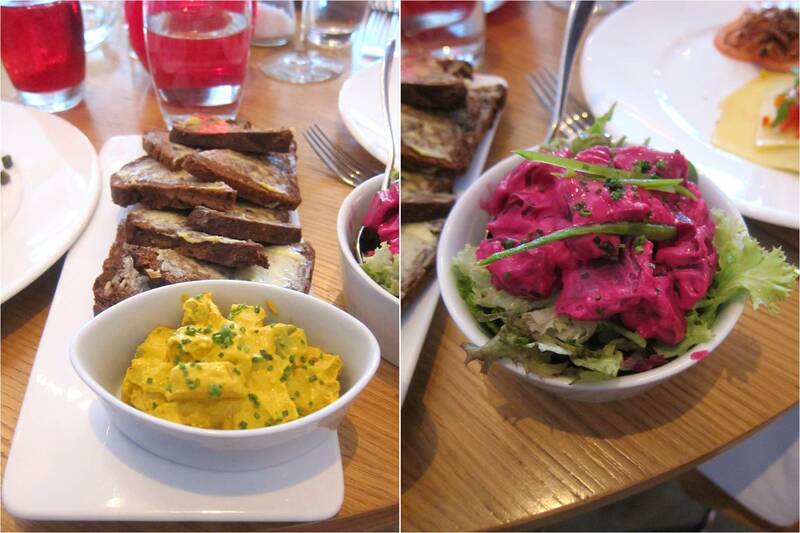 and ordered the curry salad and beetroots in horseradish cream. I didn’t have the opportunity to taste this either, although I think I had a smaller version of the curry with my herring at lunch), but it certainly looked appetizing. 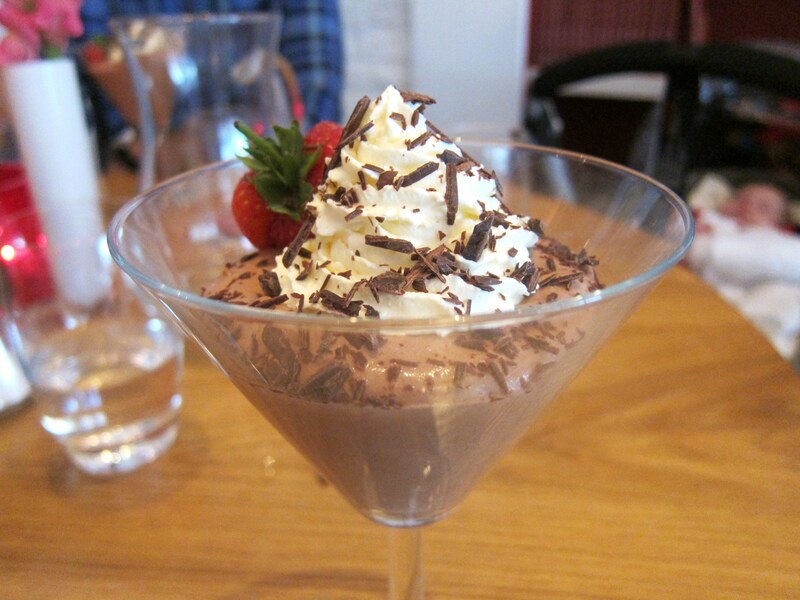 I did get a bite of the chocolate mousse and it was lighter than I had expected from the billing of “double chocolate” – also, none of us could really taste the horseradish in the cream. It was borderline passable but not memorable. I also got one small bit of this and didn’t think much of it, unfortunately. It was quite watery and generally lacking any discernible flavor – the only thing I noticed was the slightest taste of apples (thank god, because it was made of them) and a touch of Amaretto. 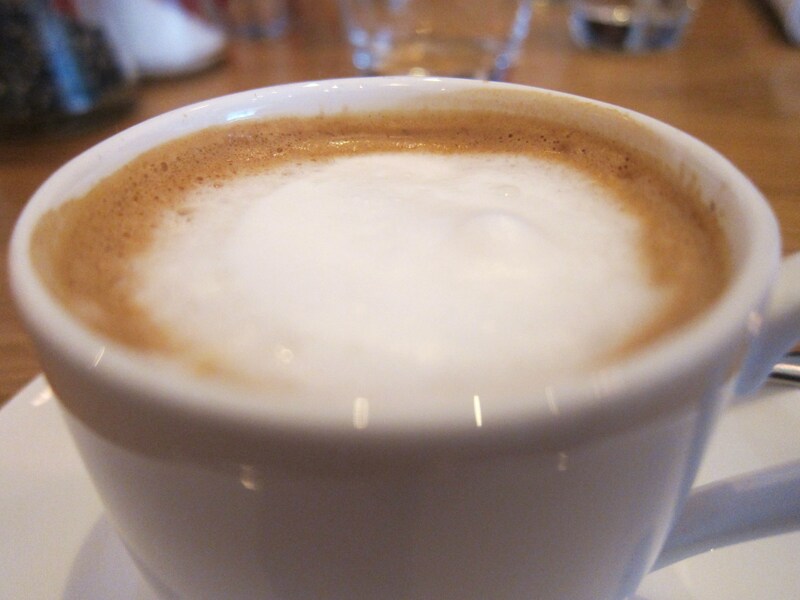 Well, at least I had been happy with my own food this time around, and decided to finish the meal off with a single macchiato, as is often my want, which was perfectly fine. 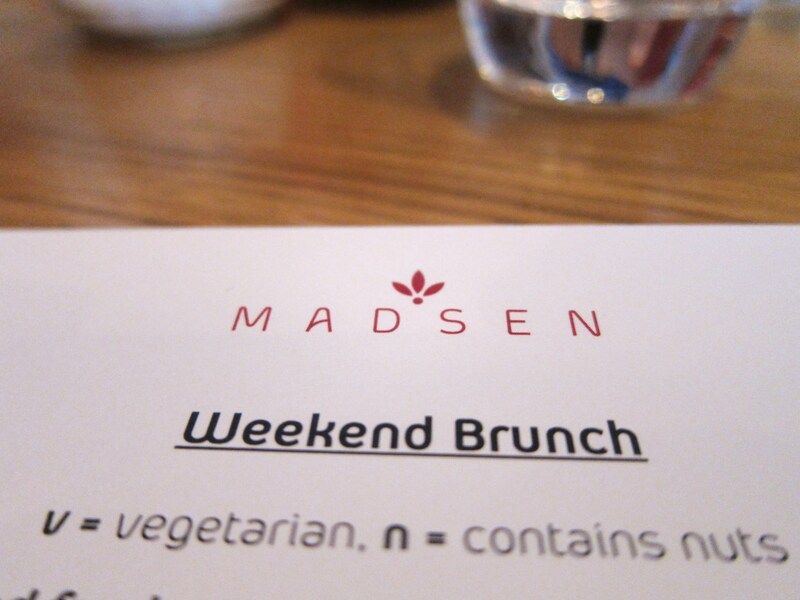 To be honest, I’m not entirely sure what to make of Madsen. On my two visits, I noted that it was casual yet subtly elegant; the plating of all of the dishes was clean and appealing; some of the food was fine and occasionally good, but it was also sometimes not worth eating (in a restaurant when you’re paying) IMHO; and the service was pleasant enough. I really want to like the place, but certainly can’t say I’m that enamored – and if I were a redheaded British comedian, no, I probably wouldn’t really be that bovvered. On both occasions I wandered downstairs – passing the cute little private room on the way – and walked by the kitchen on the way to the bathroom. Both times it seemed deserted, with seemingly only one chef present. So maybe the culinary experience didn’t live up to my expectations because we ate at odd hours when the kitchen wasn’t well staffed (although it was packed upstairs at brunch), or maybe I didn’t order the signature dishes, if they have such things (but of course everything at a ‘good’ restaurant should at least be good). 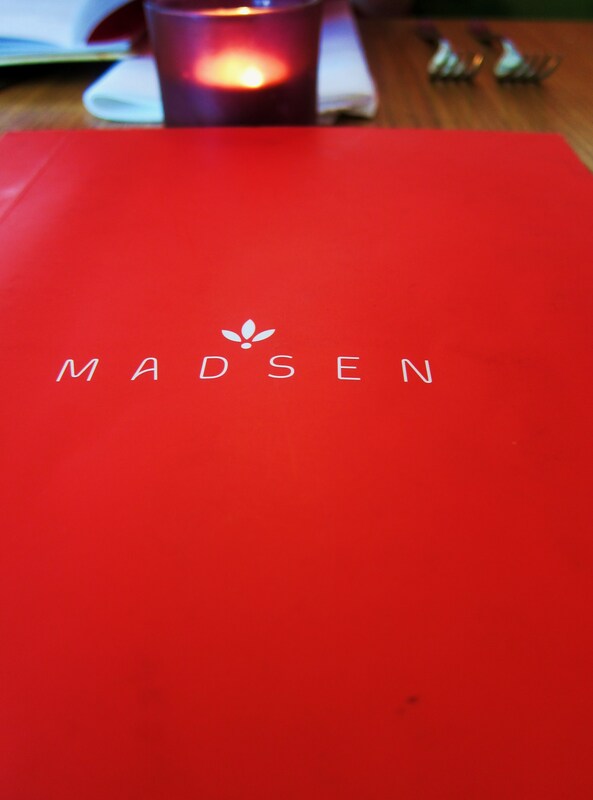 Mrs. LF made a good point when she reflected that the food we have had at Madsen hasn’t really been ‘cooked’, per se, but rather the task of the chef has been to put together different ingredients. I am sure some dishes (maybe the ones at dinner time, when we have not been), involve more cooking skill, but the food we had was very simple, and as noted above a few times, it’s the kind of food you could make at home and is not necessarily worth going out to a restaurant to eat. For those of you who have been, what do you think – have I missed out on something special or have I gotten it mostly right? I’m befuddled. I was in Stockholm last night due to a sort-of last minute emergency at work. From the end of 2008, going back about 3 years from then, I came to Stockholm on a monthly or bi-monthly basis as a result of my job. 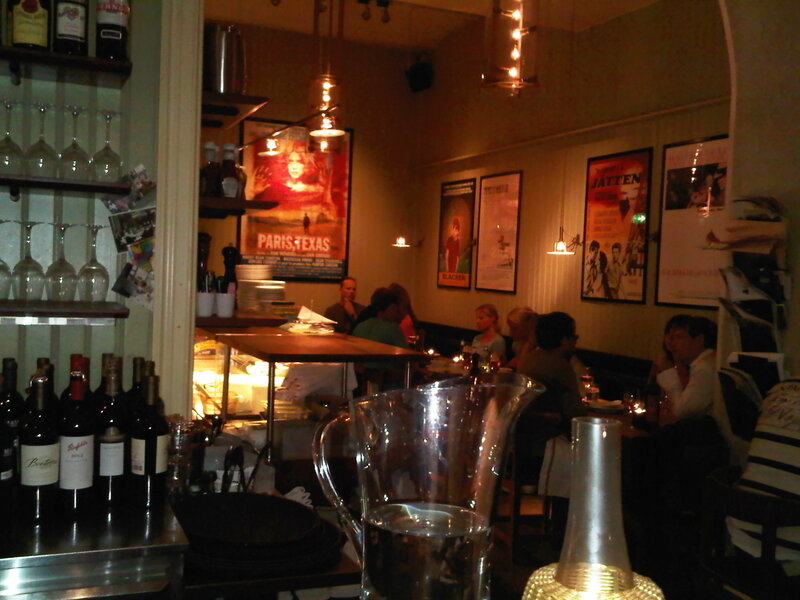 I have come to really adore Stockholm, and Sweden in general, over this time period. Some of the reasons for this include the general friendliness and openness of the Swedes, plus the fact that in Stockholm all of them speak near-perfect, if not perfect, English (at least in my line of work); the cleanliness; the charming Gamla Stan (Old Town) of Stockholm, plus its many other attractive neighborhoods such as Södermalm; the clean & fresh air and water everywhere; the relative under-population; but most of all, the fact that I don’t recall ever having a bad meal here. The produce is of a high quality, and they have the most amazing assortment of breads, which are all good in my book. When in Stockholm, my evening stroll through the Old Town inevitably seems to lead to one destination when I am solo: Grill Ruby. As I headed off from my hotel on foot last night, I thought about my options for the evening. I was grateful to have been given the green light to abandon my clients (who were dining in our hotel – yawn…), and was looking forward to a well-deserved relaxing meal after what has to be one of the most stressful 7-day periods I’ve had in a good few years. Although I was considering Sally’s Bar, I knew deep down that my walk would end up at the door of the steakhouse-esque place that hasn’t failed me so far. I had to employ some quick spy tactics as just outside of Grill Ruby I saw two of my colleagues from London. I really didnt’ feel like talking shop, so I quickly did a 180° and ducked down an alley, hoping they wouldn’t see me. I was successful, and eventually meandered back to my chosen destination. 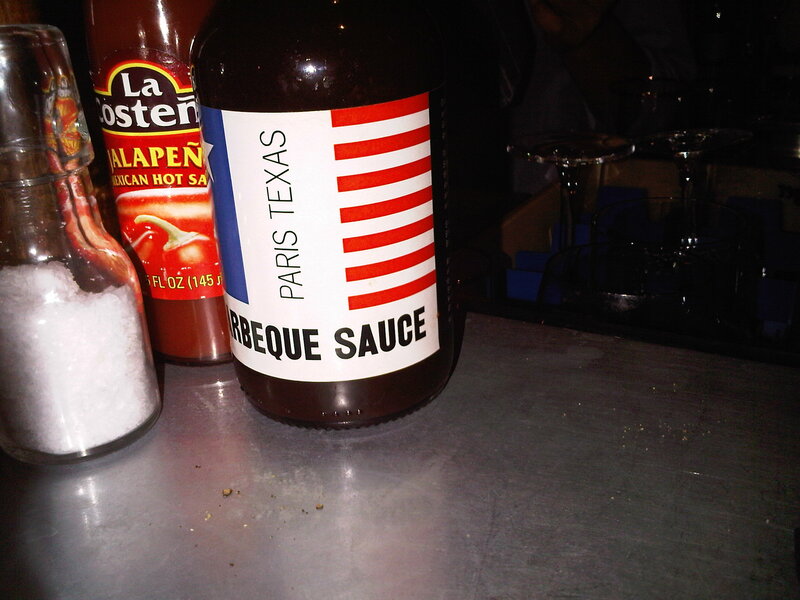 I am always slightly confused about the name of this place – I think the official name is “Grill Ruby”, but on their business cards and on their own barbecue sauce bottles, it says “Paris Texas”, so it is a bit confusing. 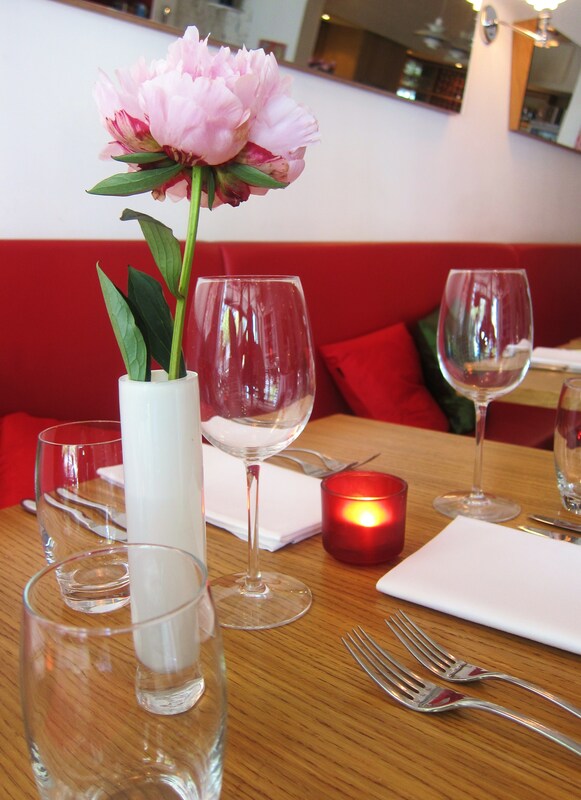 Plus, there is the sister restaurant “Bistro Ruby” next door…? 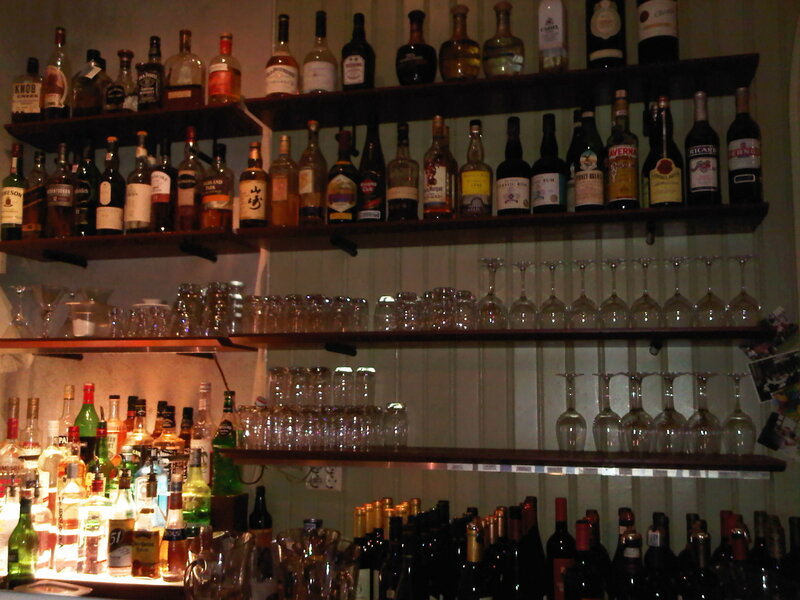 Anyway, I had arrived, and quickly took a seat at the bar – always the best bet when you are dining alone as it means you will normally have some ongoing interaction with the staff. This is one of the best barbecue sauces I've had - sweet, tangy and with a slight hint of spice...I can't help but love it with my meat (I guess I am really American after all...). It is a shame you can´t buy it or take any back with you! My brilliant waitress asked me if I had been here before, and I said yes. So she quickly told me that yes, I was a ‘regular’ and therefore didn’t mess around. She promptly asked me what cut of meat I was after, and then asked if I would like it medium rare with chili bearnaise sauce and a tomato salad on the side (2 sides are included in the price, and there are about 10 to choose from), to which I said yes. She then proceeded to recommend a glass of wine by the glass, which was a Californian Zinfandel I hadn’t had before, so again, “Yes, please,” I responded, as she genuinely said she loved it herself. The wine arrived, and I loved it too after only the first sip. 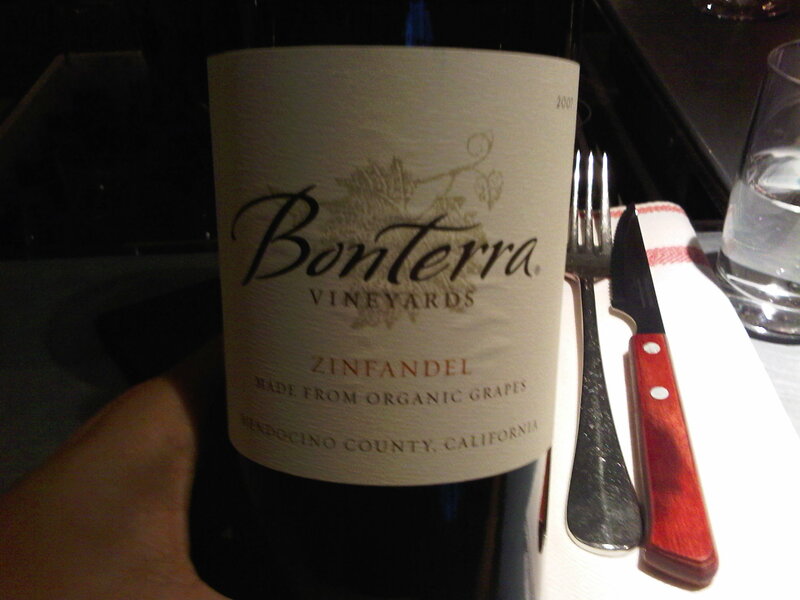 It was a Bonterra Zinfandel from Mendocino made from organic grapes and came with a host of ‘green’ credentials. 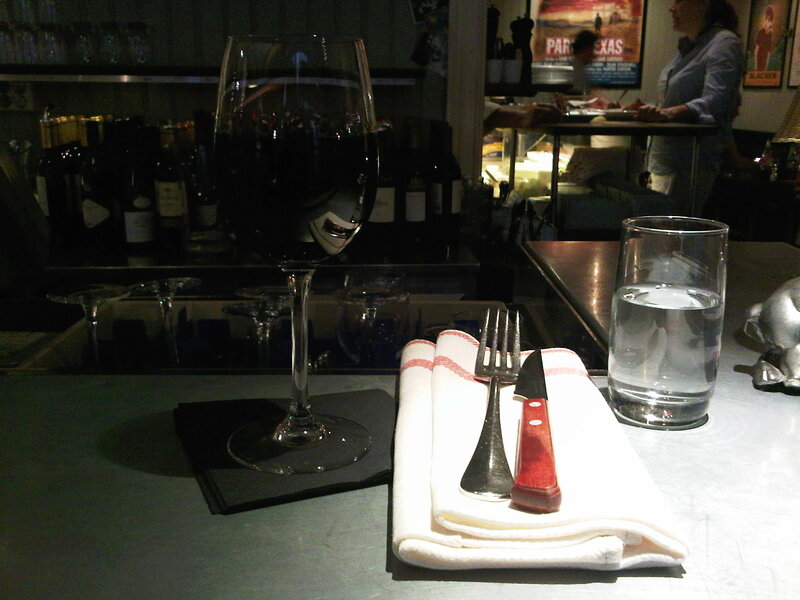 I couldn’t stop sipping it as I waited for my ribeye (my selected cut of beef). 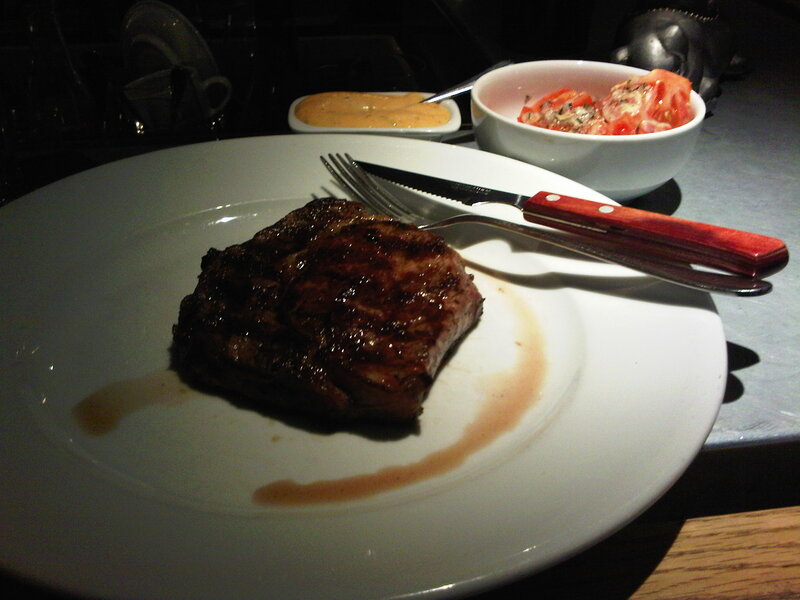 My meal arrived, and I cut off the first slice of steak. To my disappointment, it had been cooked almost well-done (a first here, as it has always come cooked as requested in the past), and I had to send it back as it wasn’t even close to being medium. What I liked is that the waitress didn’t bat an eyelid, said it was the kitchen’s mistake, and told me I would get another, fresh salad (I was so hungry I had already almost demolished it by this point). Can’t imagine that happening at some London institutions, where you would at least get an eyebrow lift or some sort of push-back from the staff before admitting that something was actually wrong. She said I would have to wait a little while, but I wasn’t bothered. It came back about 10 minutes later and was perfect this time. I asked her where they source their steak from (I had never bothered to ask before), and she said that right now they are getting their steaks from Germany, but that their lamb comes from elsewhere and that sometimes they get steak from Scotland – they just buy the best of what’s on offer at the time. In any case, I took my time with this steak as it was really delicious and satisfying, and also took my time with my second glass of Zinfandel :). 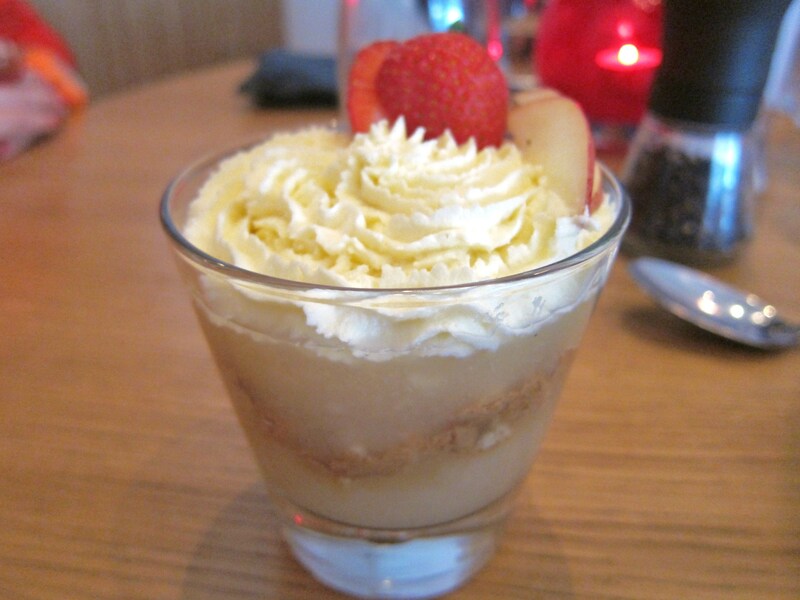 As I had been so good (by not having fries or potatoes of any kind with my meat, you see), when the waitress asked me if I wanted to have a look at the dessert menu, the answer was a resounding “Yes, please” (again). 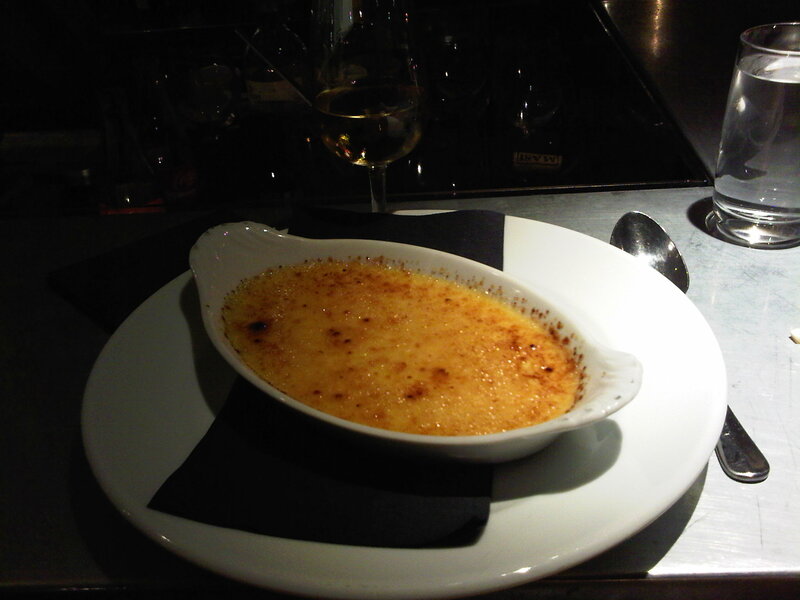 I asked her if the pecan pie was any good, and she said it wasn’t her favorite, and to go for the crème brûleé. 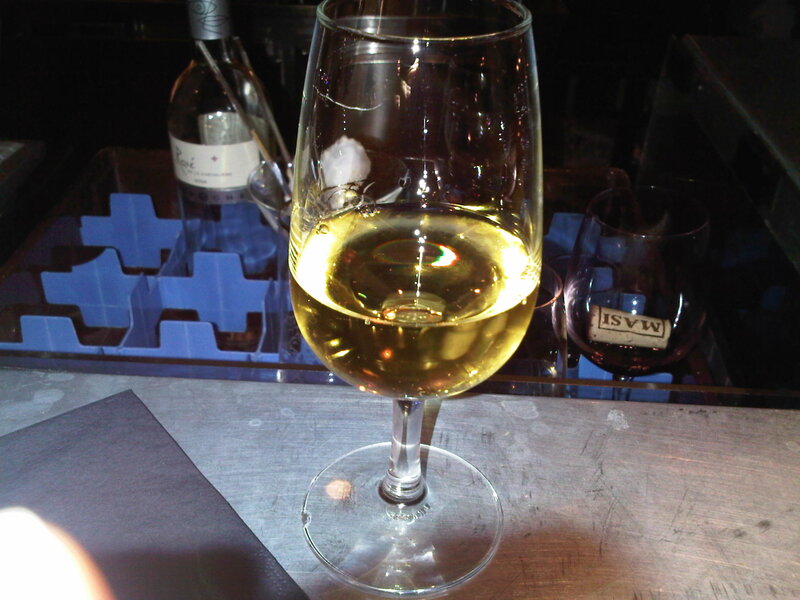 Given her accuracy so far, I didn’t object, and also didn’t resist her offer of a glass of Sauternes to accompany it. The brûleé came out a little while later, and she told me to wait for a minute or two as it would taste better once it settled and the top bit hardened. I obliged, and she was right, it was bloody excellent. The wine went well with it and I was getting a little dizzy by this point, having not eaten much during the day and being a wussy lightweight with alcohol. I passed on coffee, as I want to sleep well for an early start the next day. I paid up, thanked the waitress for a lovely meal, and walked off (not quite in a straight line), teetering back towards my hotel. In my mind, I was thanking this lovely restaurant and city for making my trip here truly worthwhile, as without this evening, it would have just been a stressful, feckless 2-day tour of Stockholm’s finest meeting rooms. 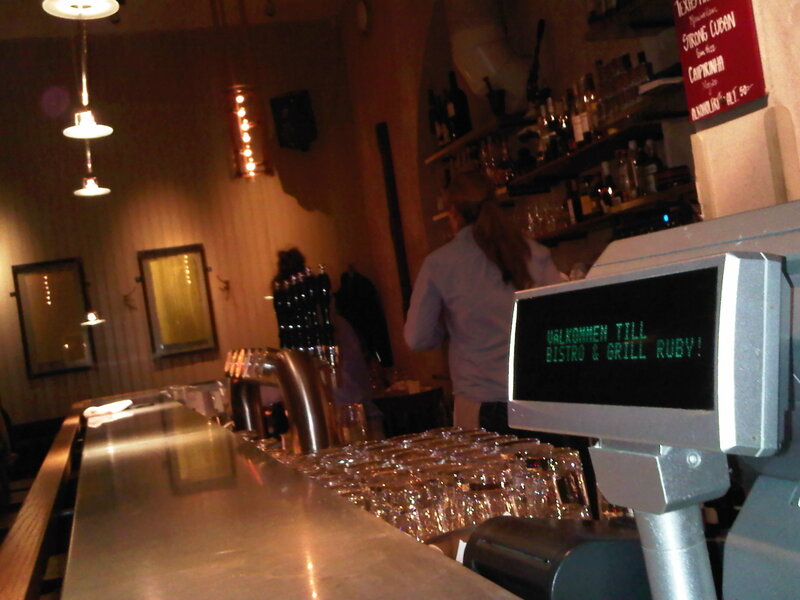 If you are ever in Stockholm on your own and are a carnivore, I suggest you make your way to Paris, Texas / Grill Ruby (NOT Bistro Ruby – I have never been), and sit at the bar. You should have a good meal and a good time. 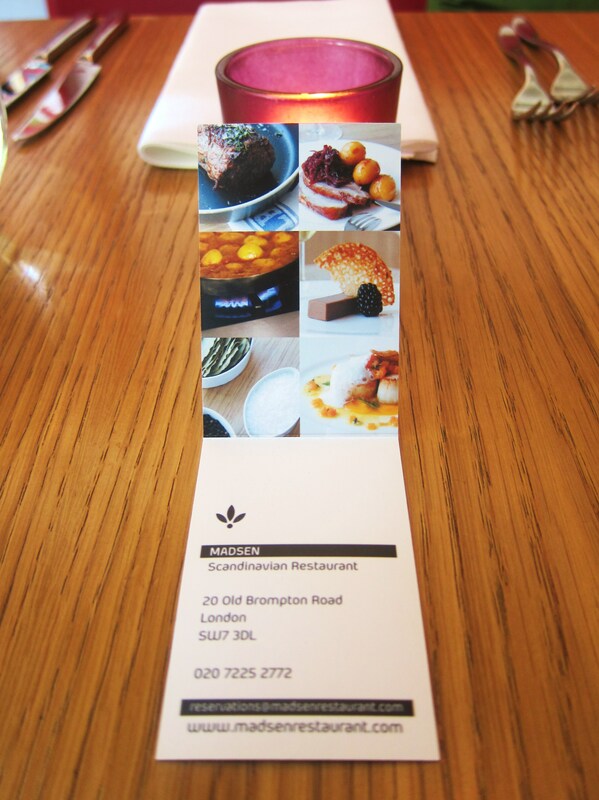 PS – I was a little bit too much the worse for ware to give the restaurant an official rating on this occasion, but it is a solid 7/10 in general given my past experiences.